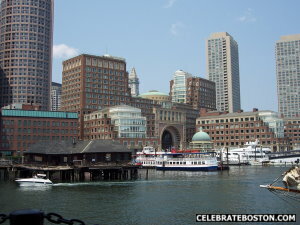 The Boston Harbor Hotel is located at Rowe's Wharf on Atlantic Ave. The wharf was built in 1987, and can be considered the symbolic gateway of the port of Boston. A public walkway, runs along the waterfront side of wharf, creating a continuous path from Long Wharf, past the New England Aquarium, to the Northern Avenue Footbridge. The design of the building had incorporated height limitations, with the higher stories set back, which created many unobstructed views of the harbor. A domed arch is located in the center of the complex. The building can be considered architecturally beautiful; a rare gem in the city. The water taxi to Logan Airport departs from Rowe's Wharf, as well as other water shuttle services. The hotel is located in the south wing of the building, with residences on the north side. Rowes Wharf Sea Grille can be found on the water side of the hotel. The cafe hosts a summer movie series called Friday Movies by Moonlight. An outdoor screen is set up on the side of the large gazebo. Restaurant patrons and pedestrians can watch a movie and enjoy the ambience of the waterfront. The atmosphere is more upscale than Hatch Shell or City Hall Plaza events, due to its location along the harbor. Due to popular demand for Boston Harbor Hotel movies, we have included the official time for sunset, which is when the sun drops below the horizon. Arrive before sunset of course! Please note that during inclement weather, Friday Movies are canceled. A notice are sent out via Facebook and Twitter by 3 pm on the day of the movie. Music performances on other nights of the week are usually moved inside to the Sea Grille.